It's time for another challenge over at ABNH today! 1&4. So in celebration of it being the 1st of 2014, we thought it would be fun to incorporate the numbers of the year somehow, so we want you to use 1 of something, and 4 of something else! 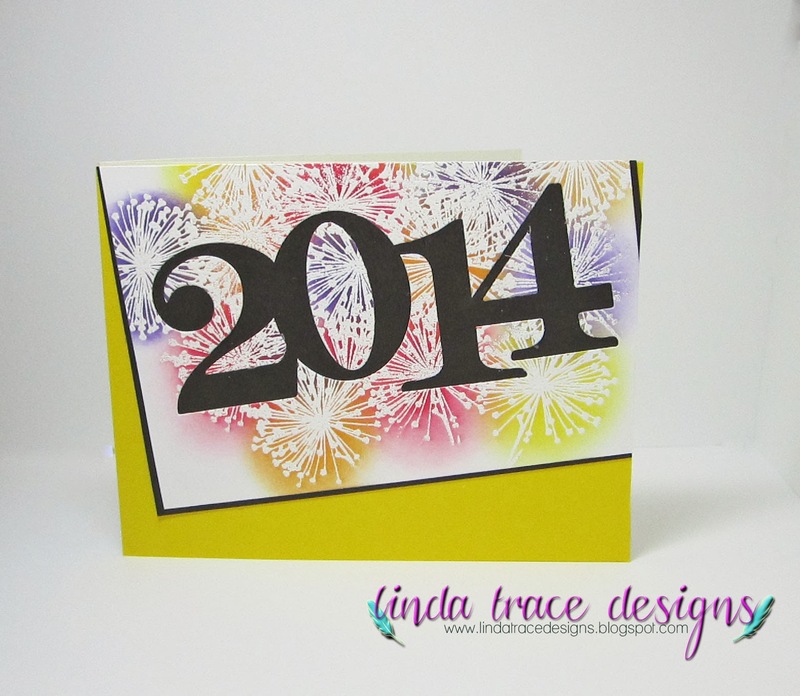 It can be 1 stamp and 4 patterned papers, 1 wood veneer and 4 inks, anything you like! But you have to specify what your 1 and 4 items are! So I deceided to go with 4 ink colours and 1 stamp. This stamp is SO old but it's still such a goodie. that's what I used for my fireworks! So fun when you can get more uses out of your stamps than their intended images! So a very easy card to make. Stamp the 'head' of the flower multiple times over your cardstock, in Versamark ink. Using little sponge daubers, spread ink over the fireworks-bursts, starting from the centre and working outwards (I used a circular motion). Diecut the numbers (you could easily do this with a word too). The die I used is from PTI. Mount the panel onto black cardstock, then adhere it to a bright cardbase at an angle! Trim off any excess cardstock overhang. I hope you like it and you'll join us over at ABNH for our first challenge of the year! Such a clever use of that stamp! Love how this turned out, Linda! Awesome design! Aren't you one smart stamper? Love it! I love this! Don't think it could be any more perfect for a NY Card. Just popped in to say I think this card is stunning! Then I started browsing - love all your creations!